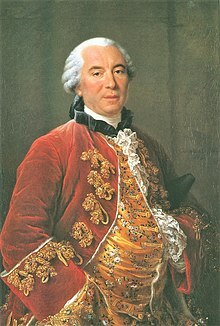 Georges-Louis Leclerc, Comte de Buffon (7 September 1707 – 16 April 1788), usually called Buffon, was a French naturalist. He was also a mathematician, cosmologist and encyclopedic author. His collected information influenced the next two generations of naturalists, including Jean-Baptiste de Lamarck and Georges Cuvier. Buffon held the position of Intendant (Director) of the Jardin du Roi, now called the Jardin des Plantes; it is the French equivalent of Kew Gardens. The Lycée Buffon in Paris is named after him. Buffon is best remembered for his Histoire naturelle. "Written in a brilliant style, this work was read ... by every educated person in Europe".p330 It was translated into many different languages, making him one of the most widely read authors of the day, a rival to Montesquieu, Rousseau, and Voltaire. In the opening volumes of the Histoire naturelle Buffon questioned the usefulness of mathematics, criticized Carl Linnaeus's taxonomical approach to natural history, outlined a history of the Earth with little relation to the Biblical account, and proposed a theory of reproduction which ran counter to existing ideas. The early volumes were condemned by the Faculty of Theology at the Sorbonne. Buffon published a retraction, but he continued publishing the offending volumes without any change. Buffon noted that despite similar environments, different regions of the world have distinct plants and animals. This observation, later known as Buffon's Law, may be the first principle of biogeography. Buffon understood the idea of common descent, and discussed it a number of times. This does not mean he believed in it. Probably he did not, but he discussed it fairly openly on a number of occasions. Interpreting his ideas is not simple, for he returned to topics many times in the course of his work. In volume 14 he argued that all the world's quadrupeds had developed from an original set of just thirty-eight quadrupeds. On this basis, he is sometimes considered a "transformist" and a precursor of Darwin. In Les époques de la nature (1778) Buffon discussed the origins of the solar system, speculating that the planets had been created by a comet's collision with the sun. He also suggested that the earth originated much earlier than the 4004 BC of Archbishop James Ussher. Basing his figures on the cooling rate of iron tested at his Laboratory le Petit Fontenet at Montbard, he calculated that the age of the earth was 75,000 years. Once again, his ideas were condemned by the Sorbonne, and again he issued a retraction to avoid further problems. He was not an evolutionist, yet he was the father of evolutionism. He was the first person to discuss a large number of evolutionary problems, problems that before Buffon had not been raised by anybody.... he brought them to the attention of the scientific world. Except for Aristotle and Darwin, no other student of organisms [whole animals and plants] has had as far-reaching an influence. He brought the idea of evolution into the realm of science. He developed a concept of the "unity of type," a precursor of comparative anatomy. More than anyone else, he was responsible for the acceptance of a long-time scale for the history of the earth. He was the founder of biogeography. And yet, he hindered evolution by his frequent endorsement of the immutability of species. He provided a criterion of species, fertility among members of a species, that was thought impregnable. ↑ 1.0 1.1 Buffon (George-Louis Leclerc) 1749–1804. Histoire naturelle, général et particulière. 44 volumes, Paris: Imprimerie Royale, puis Plassin. ↑ 2.0 2.1 2.2 2.3 Mayr, Ernst. 1981. The growth of biological thought. Harvard. ↑ "Buffon, Georges Louis Leclerc, Comte de," Encyclopedia of Life Sciences, Biographies Plus Illustrated (H.W. Wilson Company, 2001) [Accessed December 26, 2005]. ↑ Jacques Roger 1989. Buffon: un philosophe au Jardin du Roi. Paris: Fayard. p434-35. ↑ Leclerc, Comte de Buffon 1778. Histoire naturelle, générale et particulière: supplément. 5th ed. ↑ Charles Darwin, On the Origin of Species, An historical sketch: 3rd edition of 1861 p. xiii, . 4th edition of 1866 p. xiii. This page was last changed on 1 August 2015, at 06:58.